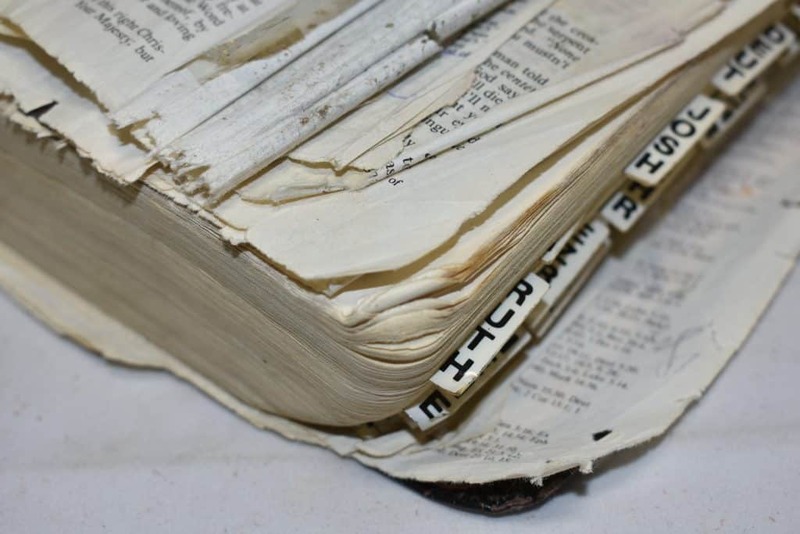 Page repair for torn, ripped or damaged pages. 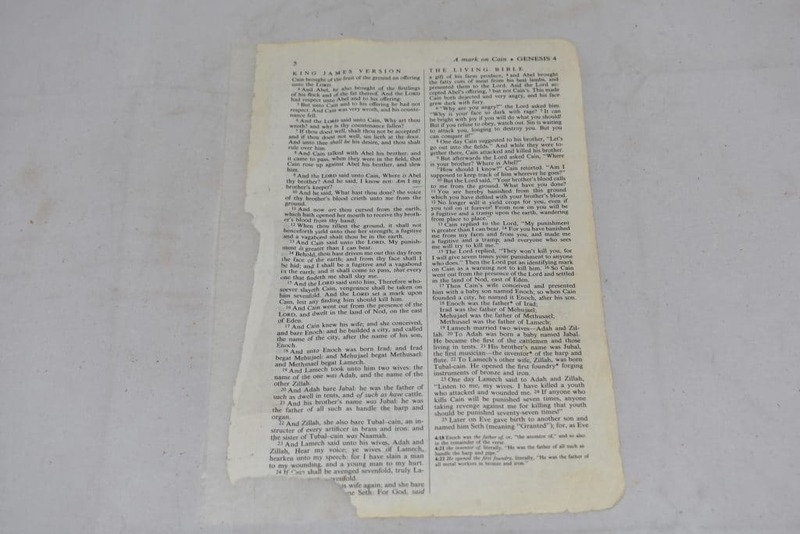 We have solutions for torn, ripped, incomplete or missing interior pages. Click on one of these links to go directly to the topic. 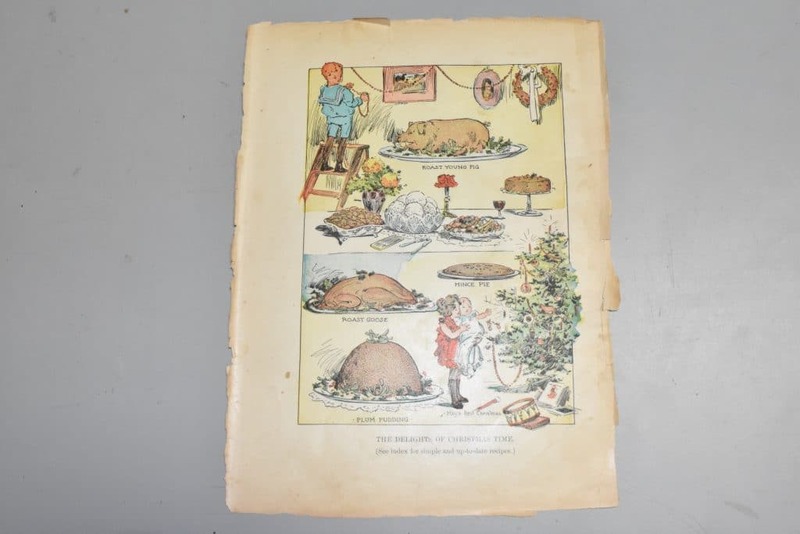 Major page tears or rips: Japanese tissue paper to the rescue! "Dog Ears" are corners and edges that are curled up, folded and rolled. "Face Trim" the page edges for a uniform clean edge. See the video! 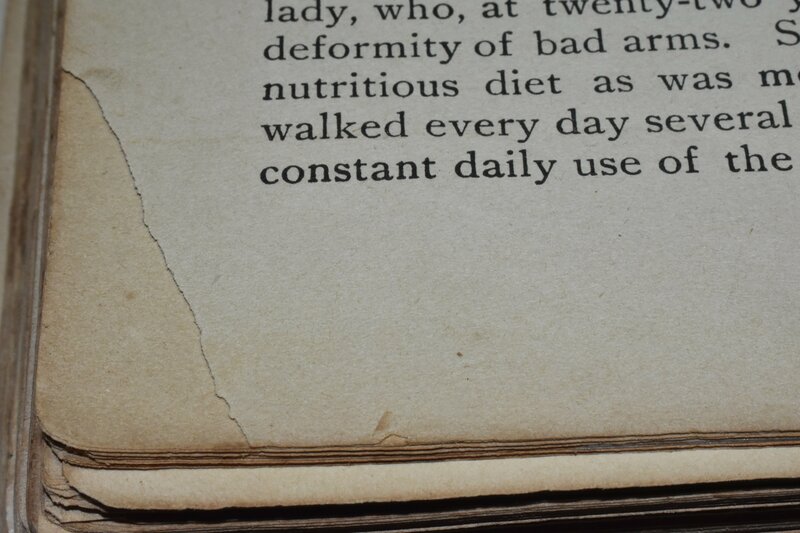 After Page Repair... Looks Great! 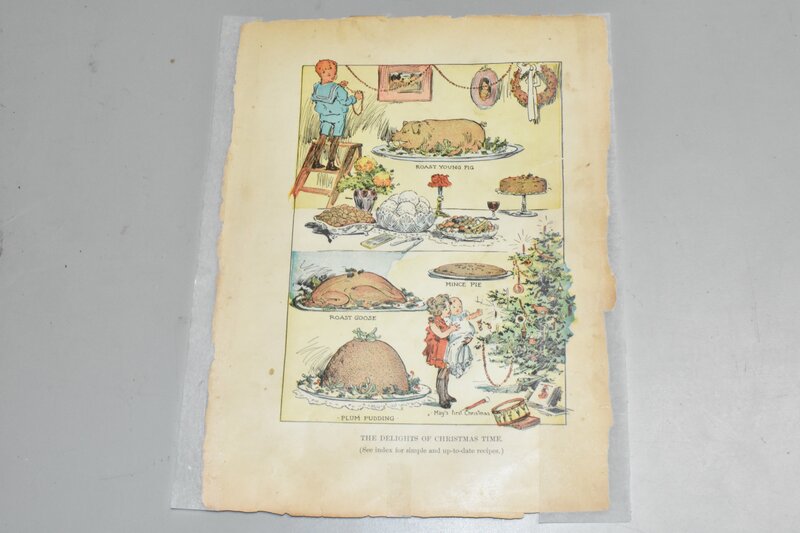 Most often, we repair pages with substantial tears or rips with Japanese tissue paper. 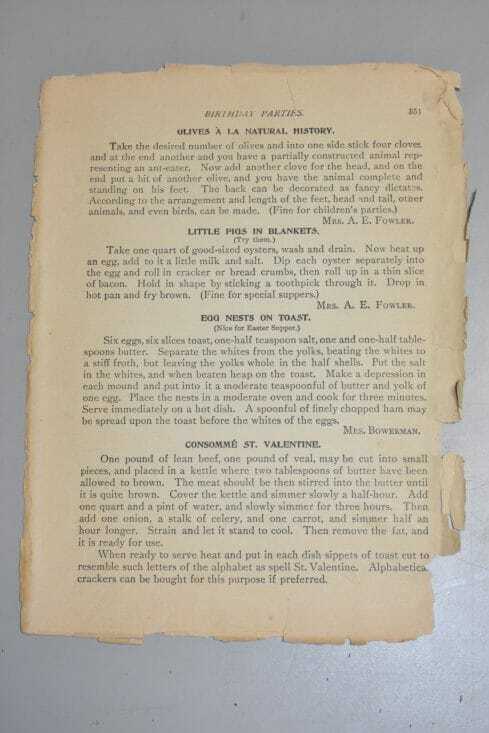 This type of tissue paper also works well when the page is fragile or disintegrating. 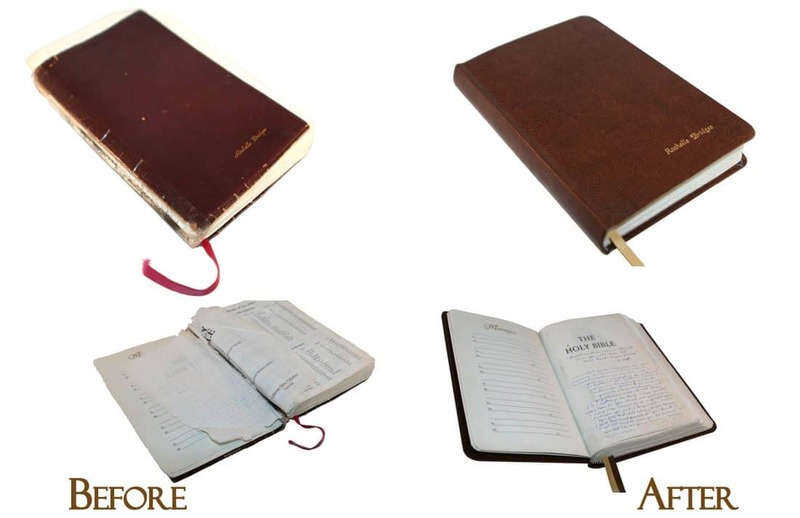 The product creates a stronger page with archival properties. Japanese tissue preserves centuries-old signatures, recordings, Marriage, Birth and Death genealogy pages and other important pages. An added benefit is that Japanese tissue paper also allows you the ability to write on the pages afterward with additional entries. 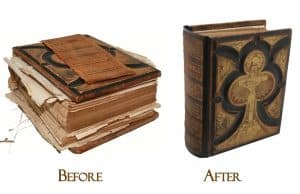 For minor tears in paper or to repair pages, we use pH neutral document repair tape and/or mending tissue that is acid-free lignin-free tissue that is very thin yet strong. 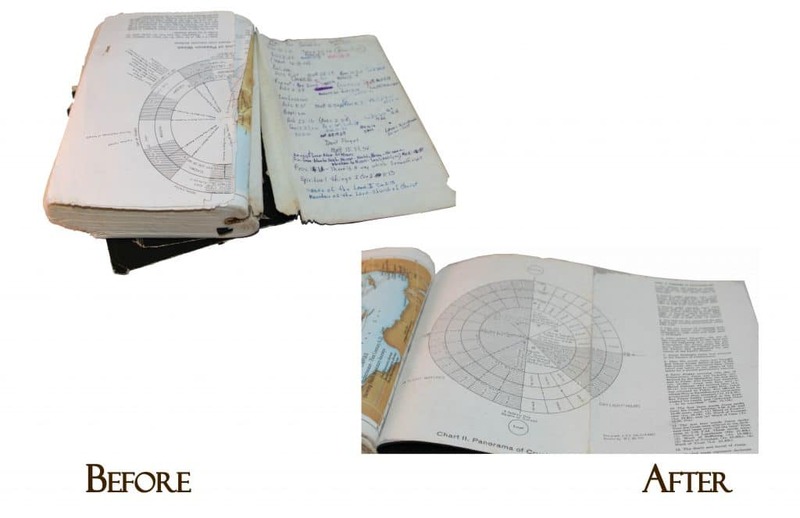 The size and location of the damage or tear sometimes determine the selection of the materials we will use for page repair. "Dog Ears" are corners that are bent. Many look "folded" or "rolled up". 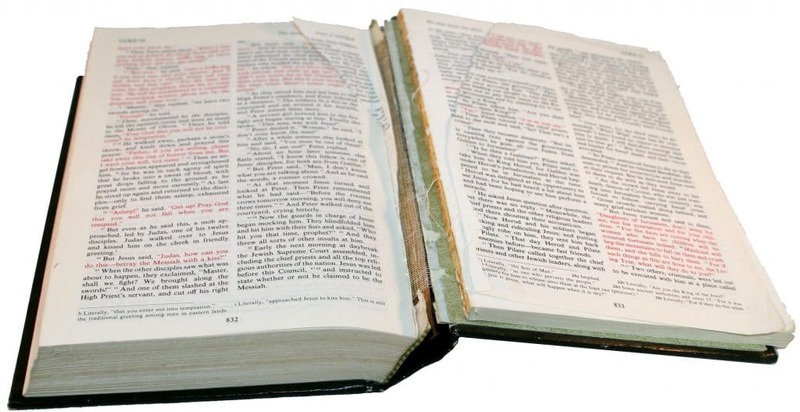 Nearly all old books or Bibles have bent corner pages and when we see them, we will bend the easy ones back into place and iron them down. 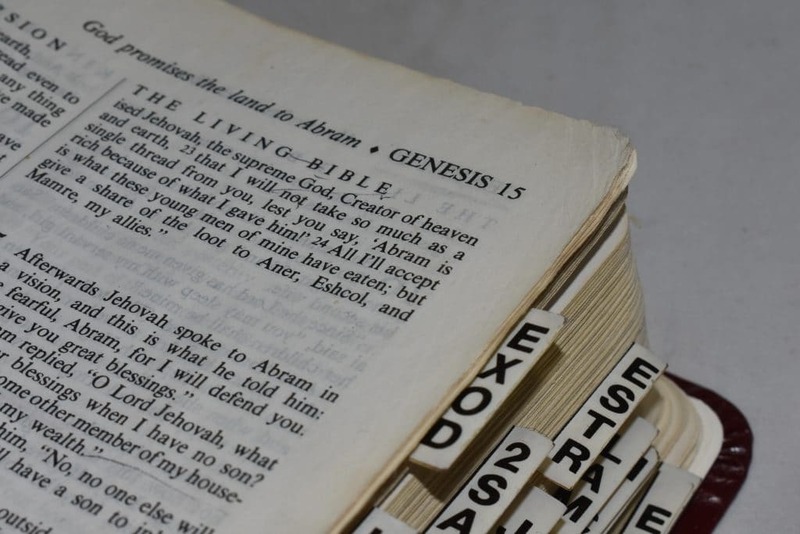 However, if there are more than a few, we offer an hourly service @ $45.00 per hour to give your book or Bible the extra attention it deserves to address "dog ears". 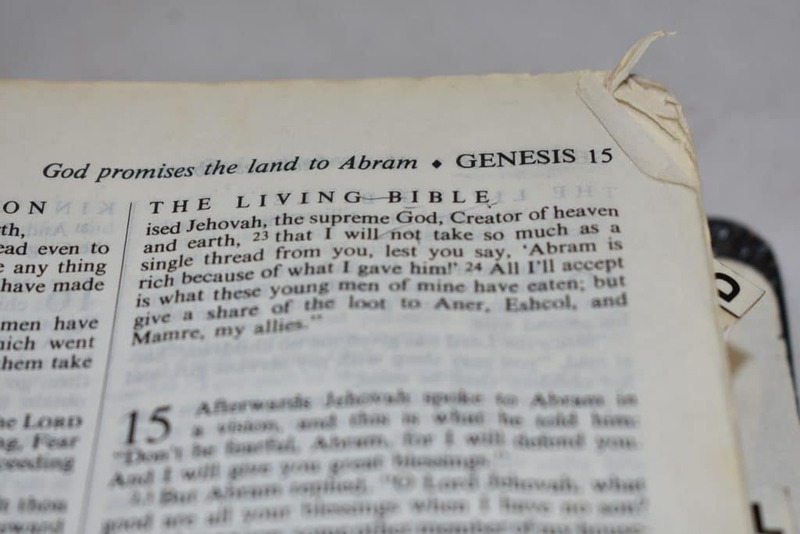 The following photos show a Bible in need of an hourly "dog ear" repair. 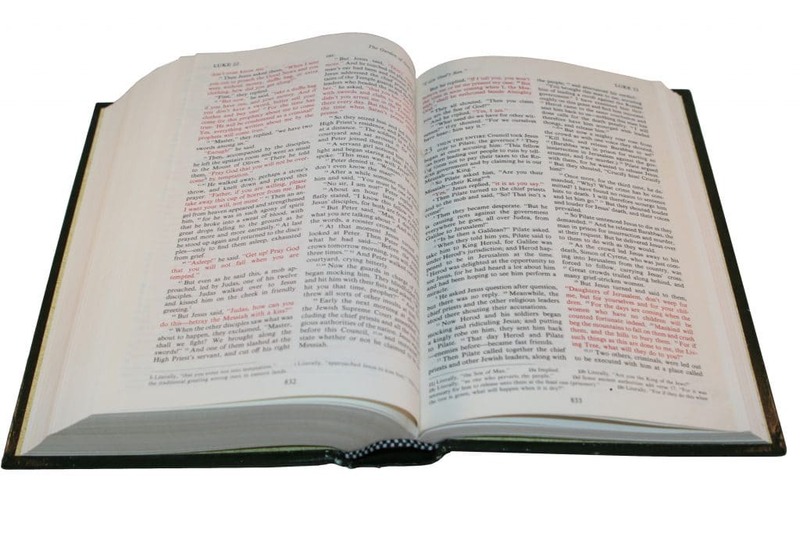 Please know that if you want the book or Bible to be face trimmed, we will need to repair the "dog ears". 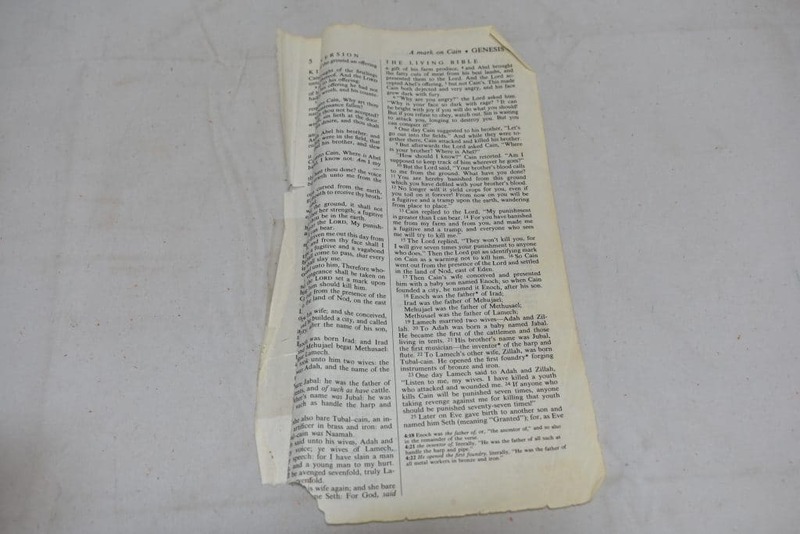 Some pages are damaged by being crumpled, taped or torn on an important side of the page where the page meets the book block. 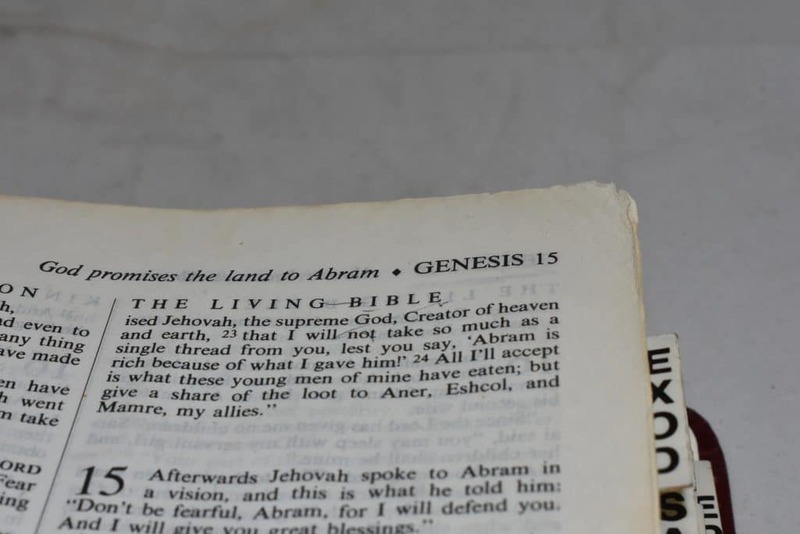 When pages are missing all or portions of their binding edge, these edges need to be replaced so that the pages can be properly bound into the book or Bible. We use Japanese tissue paper to recreate the binding edge for an entire edge or those portions that are missing. Every page needs a good straight binding edge. 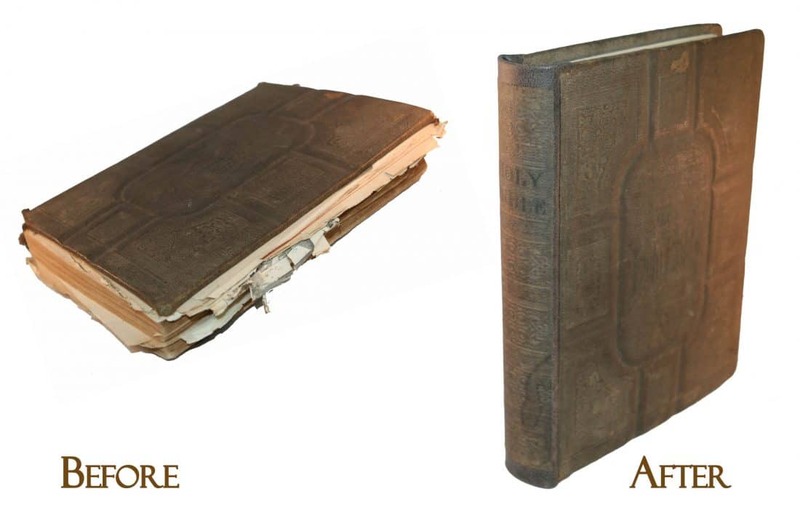 This may be a recommended service because it may be needed to reattach a page to the book block. Click the photos for a larger image. 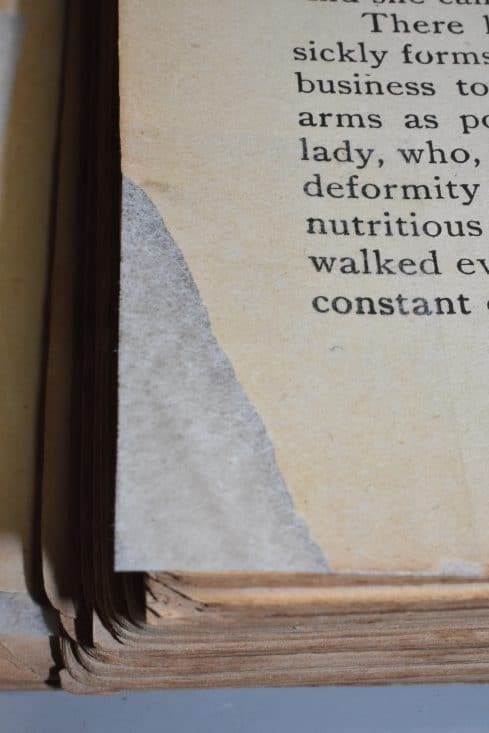 This example below shows a page with deteriorated pages on the edges that received Japanese tissue paper on the inside and outside edges. The "After" picture shows the page after we applied the Japanese tissue. After this step, the page is bound together with the book block and then trimmed. We use Japanese tissue to preserve centuries-old signatures, recordings, Marriage, Birth and Death genealogy pages and other important pages. 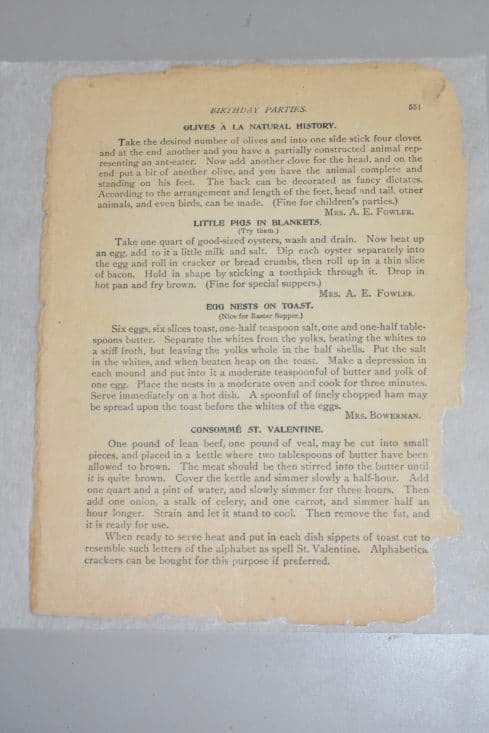 As a result, the process creates a stronger page with archival properties. Furthermore, you can write on the pages afterward with additional entries. 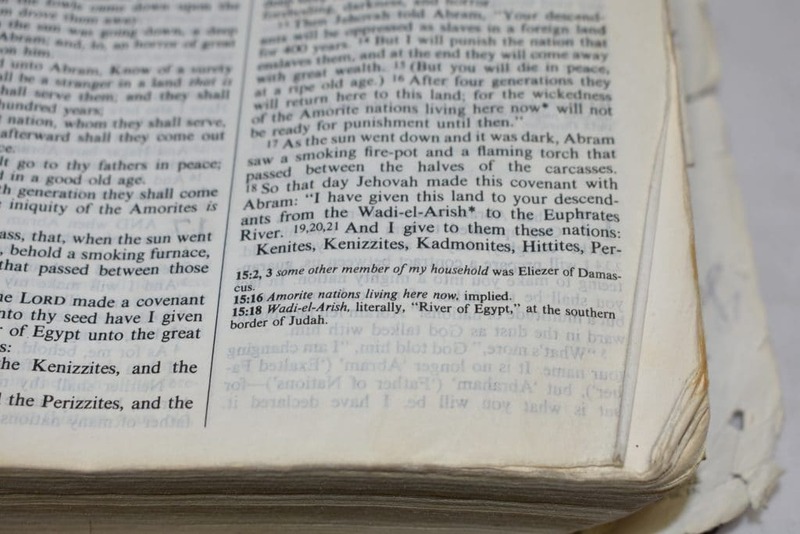 On some Bibles, we have the ability to research and reconstruct pages with missing portions of text. 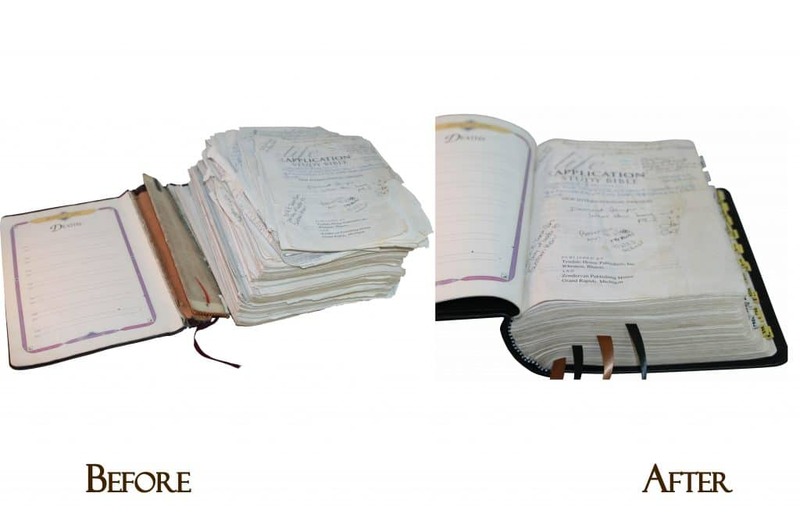 Then we can reprint these pages and bind them with the original pages. 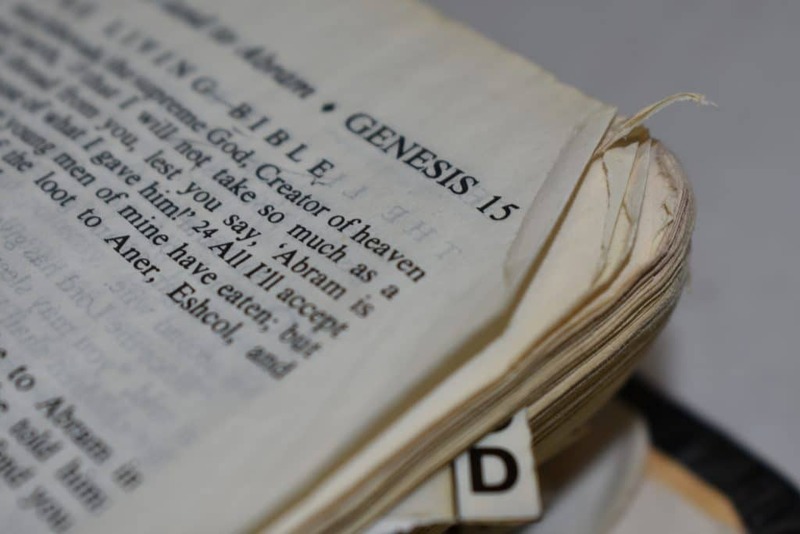 Please check with us to see if we can perform this service for your Bible version. For more information, please see our Research and Replace solutions found on #9 under Options and Extras. 7. Trimming the page edge with a "Face Trim"
A Face Trim is when we trim the exterior edge of all pages for a clean fresh look. The pages are normally trimmed 1/8”. However, please note that a face trim may also trim any handwritten notes at the edge and would not be recommended if you want to retain existing gold edge gilding. 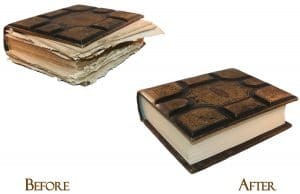 We typically do face trims unless the book or Bible comes to use with gold edge gilding. Before doing a Face Trim, it is recommended that all "Dog Ears" be repaired. Click for more information on "Dog Ears". 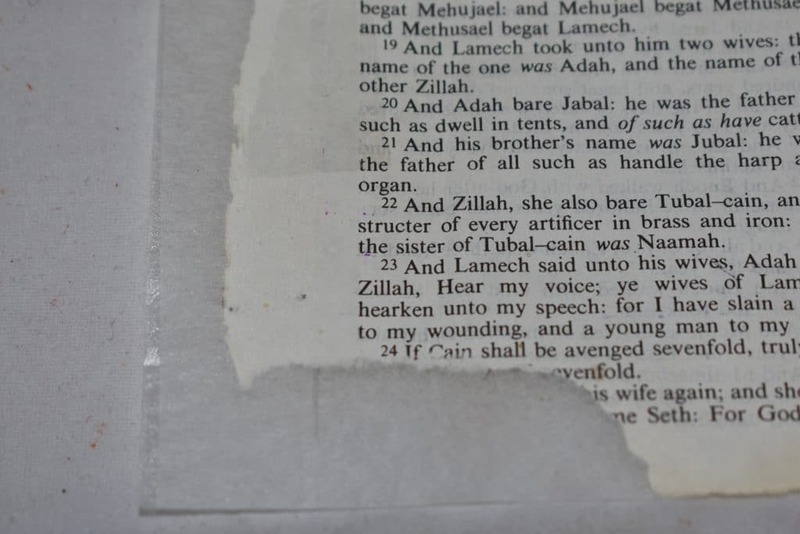 Please know that a "Face Trim" may affect any notes on the edges of the pages. 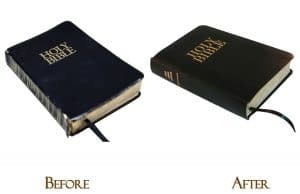 Please let us know if you do not want your Bible to have a "Face Trim". 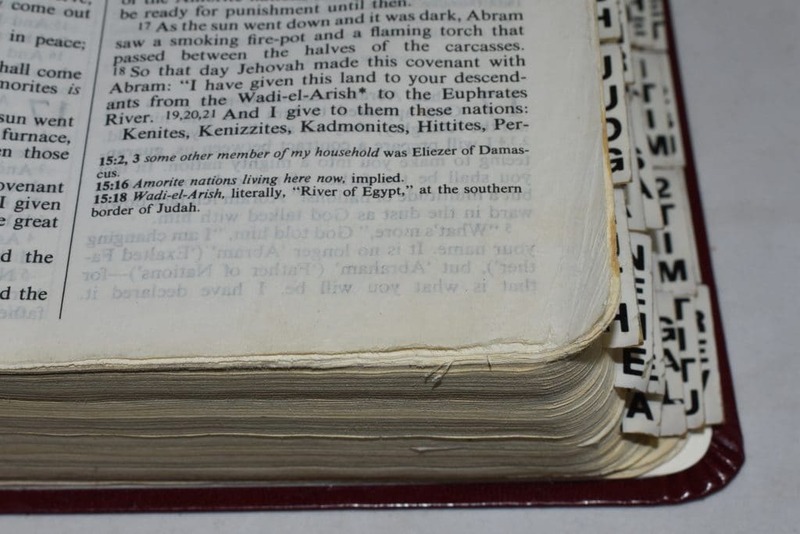 Clients may want to face trim their Bible page edges as part of the Bible Restoration service. 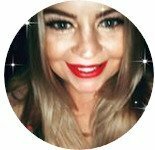 Want to see a "Face Trim" in action? 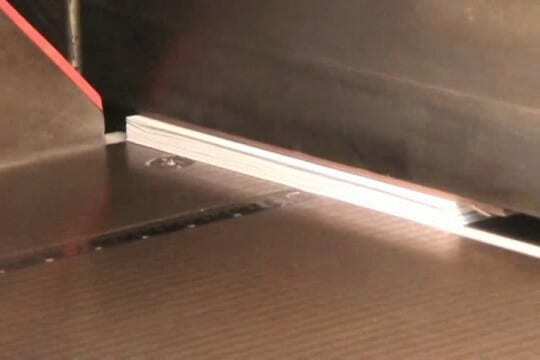 We use a professional hydraulic paper cutter that uses special shape blades and thousands of pounds of pressure to get a razor clean cut which we call a "Face Trim". It is like a hot knife going through butter! Check it out the video below starting at 0:53 for about 15 seconds. The end sheet pages are torn, partially missing and badly deteriorating. 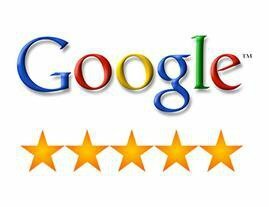 We can scan images and use graphic design software to clean up the images and remove the appearance of the tears. As shown here, we also can recreate portions of lost images!